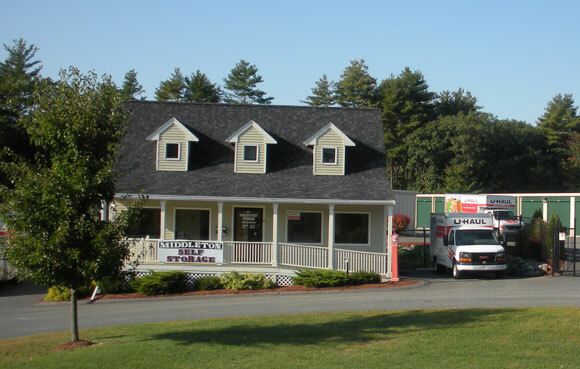 Middleton Self Storage prides itself as being a state of the art self storage facility. All of our 260 storage units are ground level access. These units all have fire protection in every unit and access is controlled through video surveillance and a computer controlled gate access system in which each tenant has their own pin number. We have an on site manager 7/24. We also provide outdoor storage for cars, trucks, boats, recreational vehicles, and contractors. Our outdoor storage areas are fenced and gated with video surveillance. Middleton Self Storage is an authorized U-Haul dealer. We have trucks and trailers for rent and a variety of boxes and moving supplies. OUTDOOR STORAGE FROM 10'X 20' TO 5000 S.F.